Colin Murphy has a provocative column in The Sunday Business Post (January 27 – behind paywall) about measuring our economy and national well-being. The traditional measure is GDP. The traditional yardstick is the higher the GDP per capita, the more prosperous the society. Maybe. A number of economists, sociologists, statisticians and activists have tried to come up with an alternative set of data to reveal a more effective picture of a nation’s well-being but the range is so extensive, the interactions complex and the permutations voluminous. Surprisingly, there is no consensus on how to do this. The OECD has devised an interesting Better Life Index comprising housing, income, employment, community, education, environment, civic engagement, health, life satisfaction, safety, and work-life balance. But there are other indexes that have over a hundred measurements and it is difficult to come up with a single number that can compete with GDP. Another problem is that wellbeing can be a subjective matter. It’s not just about how objectively we compare, it’s how we feel about our situation. In this spirit of exploring the different indicators I’d like to draw attention to three particular measurements that don’t get much airing. These are not conclusive tests or even the best indicators. But they do tell us something about people’s wellbeing. 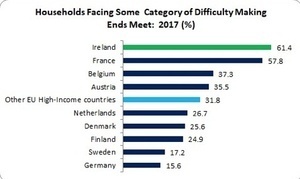 Combining ‘great difficulty’, ‘difficulty’, and ‘some difficulty’ we find Ireland at the top of the EU high-income league. 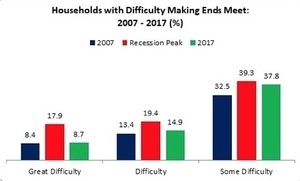 61 percent expressed some type of difficulty in making ends meet – compared to a 32 percent average among other EU high-income countries. The EU Survey on Living Conditions also asks households their ability to meet unexpected expenses. This differs from making ends meet as it refers to meeting a substantial cost such as replacing a broken cooker, boiler, fridge or car; or some other expense of equal value that is unexpected (a hole in the roof is another example). Again, Ireland fares poorly. Ireland is at the bottom – far behind the average but also far behind the next lowest country, France. 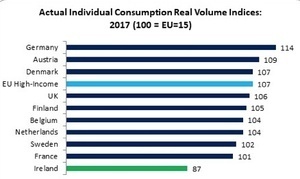 Ireland would have to increase AIC (real consumer spending and Government services) by 23 percent to reach the average. In fact, so poor do we rate in this measurement that we are behind Italy and not that much higher than Spain or Lithuania. The one drawback with this measurement is that we shouldn’t assume that high consumer or social spending equates to well-being. Consumer spending may be poorly distributed (i.e. more spending by a small group at the top) and social spending may be inefficient. There is some co-relation with this graph and inability to make ends meet: France and Ireland are low in the AIC table and high in the making ends meet table. Germany is reverse. But for other countries there are slightly contrasting stories. What do we do about this? We can make reasonable assumptions about why people are finding it hard to make ends meet: lack of income and low-pay, high rents, medical bills, cost of raising children, mortgage arrears, etc. However, we can make a more forensic analysis. Quite simply, we should ask people why they are finding it hard to make ends meet and what they need to make their situation better. The CSO could be provided the resources to conduct this in-depth survey (and the resources would be miniscule). The results should give rise to a national debate, for clearly a significant proportion of households suffer inability to make ends meet and to meet unexpected expenses. Posted in Misc and tagged Michael Taft, Taft on Thursday at 3:27 pm on January 31, 2019 by Michael Taft. Other European countries have a lot more going for them (but generally higher Taxes) with regards to socialised healthcare, socialised child care, better safety nets, big tax breaks for family units. Ireland has less protections in all of these areas and is closer to America, which is Hell-ish. Irish people are unfairly punished at every milestone in life. Its completely unsustainable. Will I be the first one to point out the very obvious fact that inability to make ends meet depends on what your outgoings are? Siege of gorse hill for instance. Home economics should be mandatory for everyone. Don’t they put this into consideration by taking an average employee, with an average income etc? Apparently it was a survey, hence my bringing it up as a point – I don’t think it’s a good metric. Some people I know earn way more than me but consider themselves “struggling to make ends meet”, but they just have ridiculous lifestyles. Other people quite close to me have very modest income but manage to make ends meet. It’s not an ideal metric. Do those who earn way more also happen to be miserable gen xers with mortgage and kids? Does “making ends meet” have any qualifying factors? Like paying for a top end TV and Sky Sports wouldn’t be included, I’d assume… but that’s a big assumption, in fairness. Clampers Outside! – the everyday expenses include food, replacement clothes and shoes, fuel, rent & mortgage, etc. 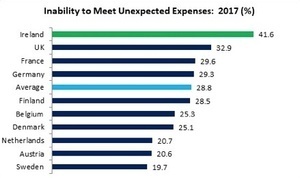 It doesn’t include large expenses like a television though replacing a TV would be part of ‘meeting unexpected expenses’. 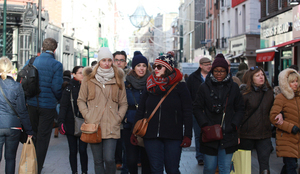 However, the usual cost would be €300 to €400. That’s a little optimistic Michael: my TV is around €400 and it’d be considered small, going by some of the neighbours’ places. Come to think of it, many of my neighbours consider themselves in the “unable to make ends meet” bracket (according to the community association) but all seem to have newer cars than me, bigger TV’s than me, sky TV, expensive phones etc. Funny how that goes, really. 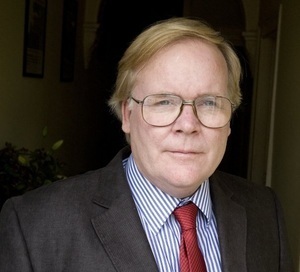 Economic Man does not live on statistics alone. Running a car gobbles money. Are they telling us drugs & hookering is good for the economy? It pretty much is confirming both should be legalised and taxes collected IMO. But yeah, GDP doesn’t really measure economic welfare as you can’t measure how evenly the wealth is spread out.. it’s a measurement of how wealthy people are doing and it’s a consideration for foreign investors.